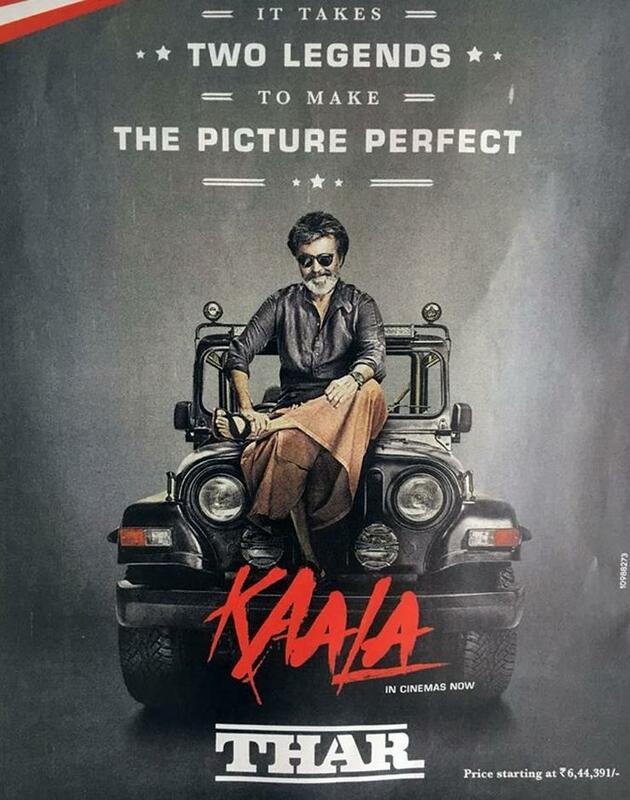 Keen to capitalize on moviestar Rajnikanth using the Mahindra Thar off-roader in his latest movie Kaala, Mahindra has just released the print ad of the Thar. The latest ad shows Rajnikanth sitting on the bonnet of the Mahindra Thar CRDe, which was also used in the movie as a prominent prop. Regular readers of Cartoq will recall that the Mahindra Thar used by Rajnikanth in Kaala has been purchased for the Mahindra museum by the Chairman of the company, Mr. Anand Mahindra. The cult status of this off road vehicle has received a further boost from Rajnikanth’s latest movie. And Mahindra is going all out to ride on this appeal. The Thar is a true-blue off-roader that Mahindra sells in India under two main variants – DI and CRDe. The DI, which stands for direct injection, is rural and semi-urban market focused. Meant to be used as a people mover, agricultural vehicle and a general purpose utility vehicle, the Thar DI has seating for 8 adults. It’s powered by a 2.5 litre, 4 cylinder M2DICR turbocharged diesel engine with 63 Bhp-180 Nm outputs. A power steering is offered as an option. The Thar DI gets rear wheel drive and four wheel drive options. A five speed manual gearbox is standard across all variants. Prices start from Rs. 6.44 lakhs, ex-showroom Delhi. The Thar CRDe, on the other hand, is aimed mainly at urban lifestyle SUV buyers who want a classic-looking ‘Jeep’ with decent interiors, seats and a powerful turbocharged diesel engine. Of course, a four wheel drive layout is standard. The Thar CRDe also gets air conditioning and a power steering as standard features. The engine is a 2.5 litre, turbocharged unit with 105 Bhp-247 Nm. A 5 speed manual gearbox is standard. The Thar CRDe can also seat 8 adults but the overall finish and interiors of the vehicle are much better than the DI variant. Pricing is also a lot higher, with the Thar CRDe priced at Rs. 9.25 lakhs, ex-showroom Delhi. « Toyota Corolla Altis to ride on Maruti power: Details!